"Urewera 17" arrestee Te Rangikaiwhiria (Whiri) Andrew Kemara also goes by the name of Rangi Kemara. While his links to the Tame Iti/Tuhoe wing of the "Urewera 17" are obvious , Kemara also has ties to the Wellington based anarchist faction. Kemara has often posted on the Indymedia website, which is edited by two anarchist "Urewera 17" arrestees, Omar Hamed and a Swiss national who still has name suppression. Kemara also works closely, in the Maori Internet Society with Teanau Tuiono, who is both an indigenous activist and an anarchist with links to the Wellington scene. Tuiono draws inspiration from the Zapatista revolutionaries of Mexico, who have turned indigenous Mayan peasants into an army strong enough to create a semi autonomous state in Chiapas State. Much like some Tuhoe seem to be attempting in the Eastern Bay of Plenty. 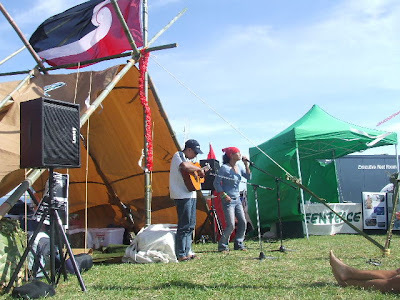 An event entitled "Nice n Native" was held in the Waikato early this year. Our whanau (family) that came together for the week ranged from the four corners of the earth, bringing together tangata whenua (peoples of the land) from Alaska, the Phillipines, The desert in Arizona and New Mexico, Australia and Aotearoa. Many peoples, many tribes, many mountains, rivers, clans where brought together at Motakotako Marae. 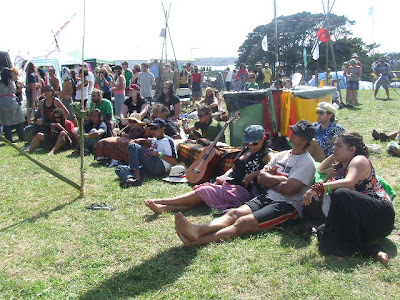 This gathering of domestic and foreign radicals was organised by Conscious Collaborations, an organisation run by Tuiono Tuiono and Kiritapu Allan. Conscious Collaborations has played a leading role in the "Urewera 17" arrestee support network. Of the 25 odd Maori activists attending Nice n Native three were the "Urewera 17" arrestees Emily Bailey, Ira/Tim Bailey and of course Rangi Kemara. Emily Bailey incidentally has visited a Zapatista stronghold at Oventic in Chiapas. Also attending Nice n Native were Tuhoe activist Ati Teepa, brother of "Urewera 17" arrestee Maraki Teepa and former Maoist activist, Helen Te Hira. The collective power of the people brought together for Nice n Native has spurred on the realization that this, and a sustainable indigenous self-determination is not only necessary but possible. By being so thoroughly but supportively humbled I was able to listen and see from a fresh perspective, and the very real hope that our communities can be healthy, whole and function independently of the capitalist empire is what I saw. I have come to recognize something of how deeply colonized I am, a good thing because now I can start the positive and humbling process of de-colonisation. Guess who has offered to host the next Nice n Native gathering? Ngai Tuuhoe has put in a tono (offered) to host the next Nice 'n' Native in their rohe (tribal region) in the heart of the Urewera. It is proposed that Nice 'n' Native 08 will take place in March 22-28 2008. Given recent events, I wonder if a change in venue might not be a good idea. New Zeal Someone, presumably involved with Conscious Collaborations has diverted my links to a report on the Nice n Native gathering and to Conscious Collaboration, so they cannot be reached from this blog. If they are similarly altered just Google "Nice n Native 2007 report" or "Concious Collaborations"
Not via your blog Trev will the "truth" be "out". I mean, Helen Clark only has to meet with the Chinese ambassador at the last lunch bar on the left down Lambton Quay and she's a commie and Mah's calling the Secretary of Homeland Security. Yous guys real lives not very interesting ot something ? Quaere ? When the Patriotic Ponce/Chickenhawk/Whatever flies half the world to have yumcha with the Godless Chinese Dictator - why ain't Mission Accomplished a commie then ? Hey, I hear they're looking for cub reporters at the recently revived old "scandal" rag, "Truth". "Truth", something of a misnomer since its name appears in almost every reported libel case in NZ legal history. I grant that I engage a measure of hyperbole but but you get my point I reckon. You should apply Trev. Then they can put out a headline reading "Trev'll Fix It !". And then you can sue for 12,000 quid and get it, just like a certain "Phillip" did some 50 years ago. Man 12,000 quid pre-sixties. Heap of putea ! Although of course we don't want to take the focus off the biggest show in town at the moment, do we ? I refer to the impending "Arms Trials".....what fun ! Check out this next week's Truth Steve. CYF ChCh is looking at your file as there was a notification on your predators activities, again!! Leave NZ children alone you dirty bugger!! Put up or shut up anon.